We print on premium latex balloons with only the highest quality latex inks. 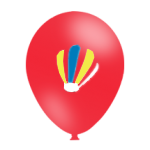 We only use helium quality, 100% biodegradable balloons because we care about the environment. Screen printed technology ensures a professional, clear imprint – unlike a stamped image which distorts when inflated.